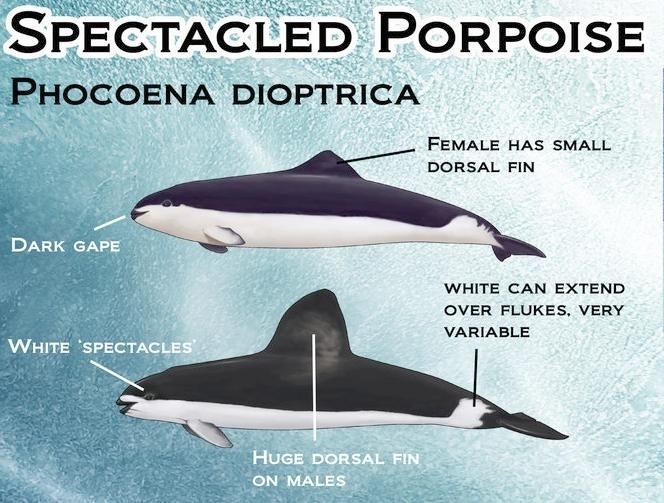 The Spectacled Porpoise gets its name from the fact that the eyes are surrounded by black circles that look like glasses. 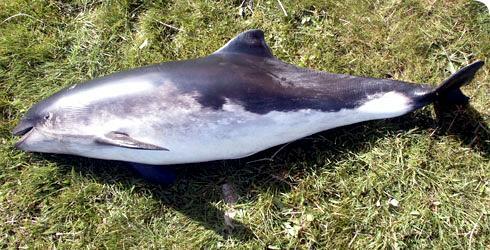 Spectacled Porpoises are rarely seen and are found only in the oceans of the southern hemisphere. 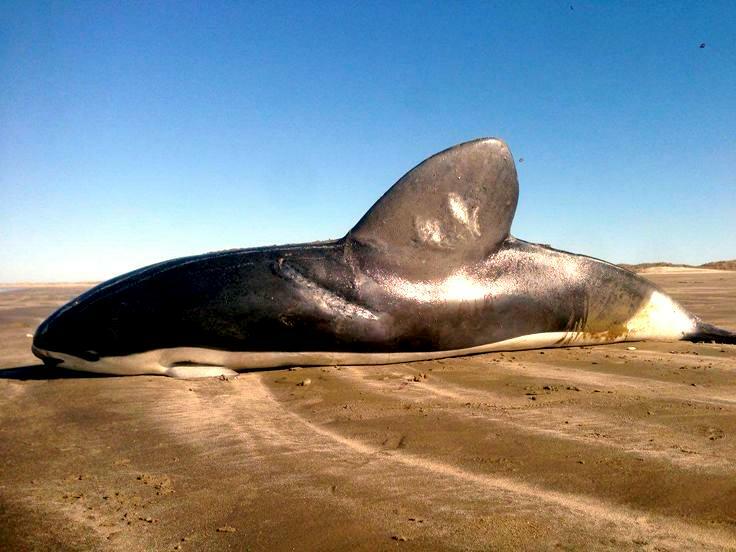 Usually they are found near the southern east coast of South America from Uruguay and Argentina to Cape Horn and also near the Falkland Islands and South Georgia. 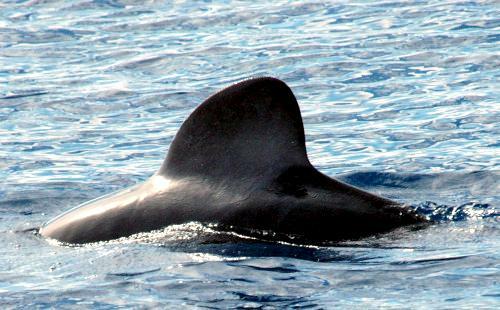 Spectacled Porpoises have been seen near New Zealand, Macquarie Island and the Auckland Islands in the Pacific Ocean and Heard Island and the Kerguelen Islands in the Indian Ocean. The size of this species can vary from about 1.25 meters (females) to 2.24 meters (males), evincing a fundamental sexual dimorphism. 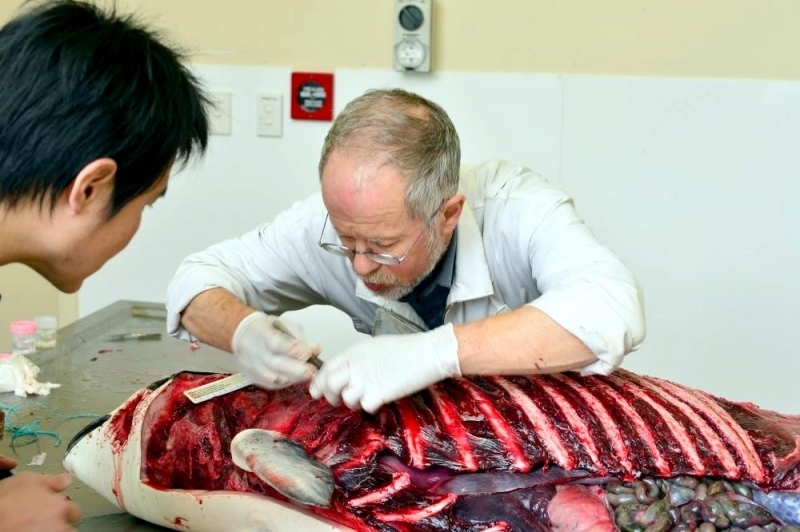 The adult body mass of varies from 55 to 80 kilograms; the largest individual found was 115 kilograms. 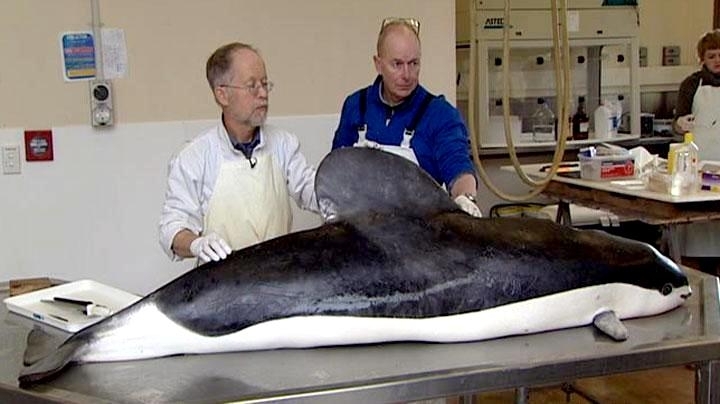 The dorsal side is a blue-black color and the ventral side is pure white. 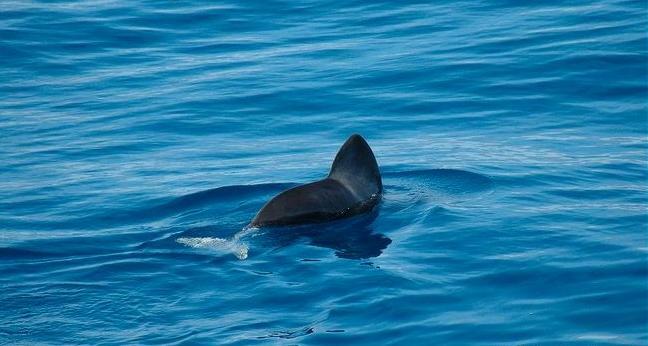 There is a sharp line that divides the dorsal black color from the ventral white color. 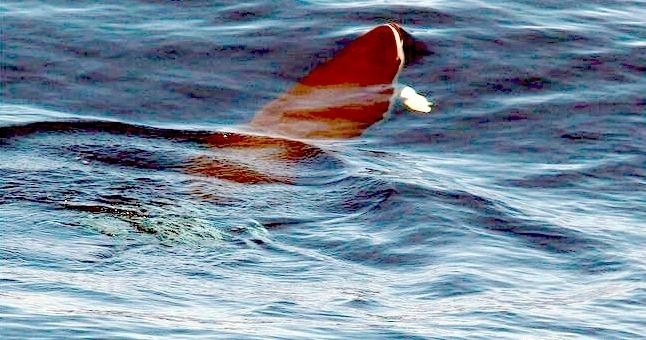 There is a gray line that goes from the corners of the mouth to the leading edge of the pectoral flippers which are white. The lips are also black and the eyes are surrounded by black circles that look like glasses. The tail fluke is dark on the top side and white on the bottom. Shape also distinguishes this species. 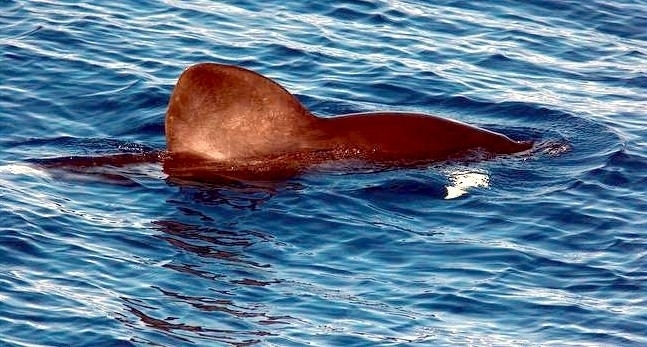 The dorsal fin is big and triangular and the pectoral fins are small and rounded when compared to other species. The teeth in the upper jaw number between 18 and 23 and the teeth in the lower jaw number between 16 and 19 on each side. The teeth have spade-shaped crowns, which is a distinguishing characteristic of Phocoenidae when compared to delphinidae, which have cone-shaped crowns. 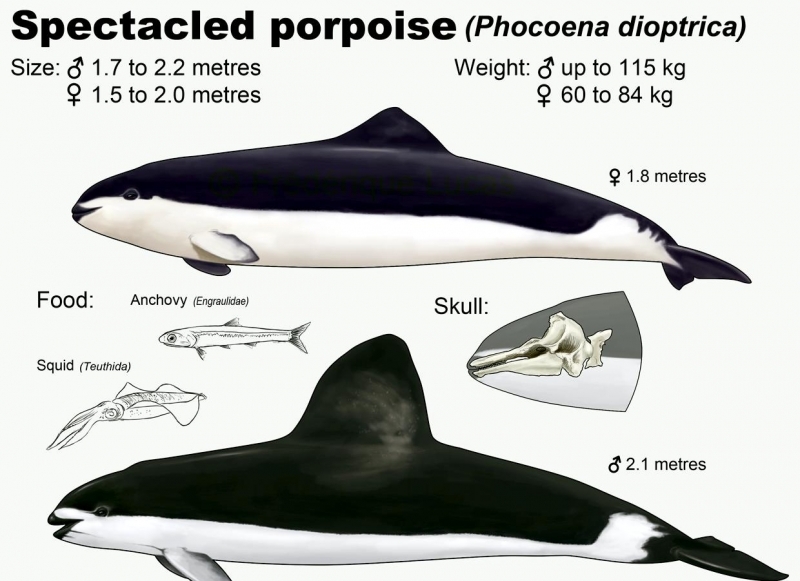 There also are some skull features that distinguish the Spectacled Porpoise from the Harbor Porpoise: the top of the rostrum of the Spectacled Porpoise is flatter and from the side, the premaxillary bones of the Spectacled Porpoise are less visible. Key reproductive features of the species are: iteroparous; gonochoric/gonochoristic/dioecious (sexes separate); sexual; fertilization; viviparous; however, relatively little information is available on details of the mating systems of this species. All mammals reproduce sexually via internal fertilization and all eutherian mammals give birth to live young. 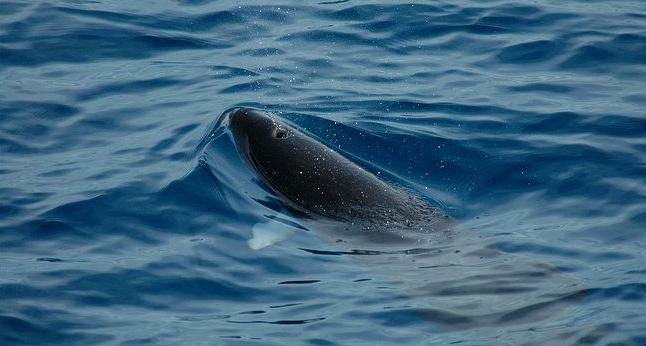 However, little else is known about the reproductive behaviors of the Spectacled Porpoise. One near-term fetus was recorded in July 1962 and another was taken in August of the same year. The first fetus was a female and was 484 millimeters long. No information was recorded on the second fetus. The young are most likely born in early spring, but no information is recorded. 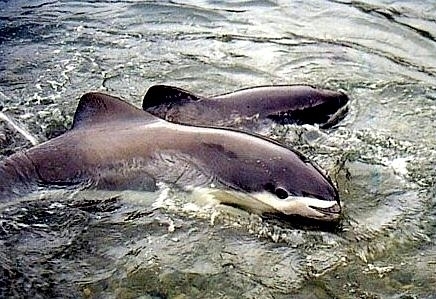 A feature common to all eutherian mammals is that females nurture their young inside their bodies until birth and afterwards provide them with milk. However, no specific information on parental investment is available. Key species behaviors are natatorial, motile, solitary & social. This species does not travel in large pods. 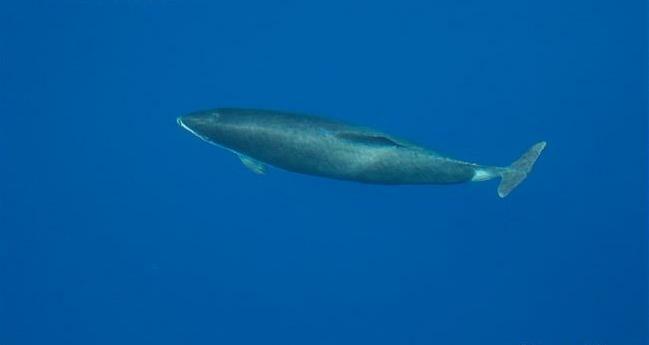 They are likely solitary animals, but they have been seen in small aggregations of 2 or 3 individuals. They are probably not migratory. 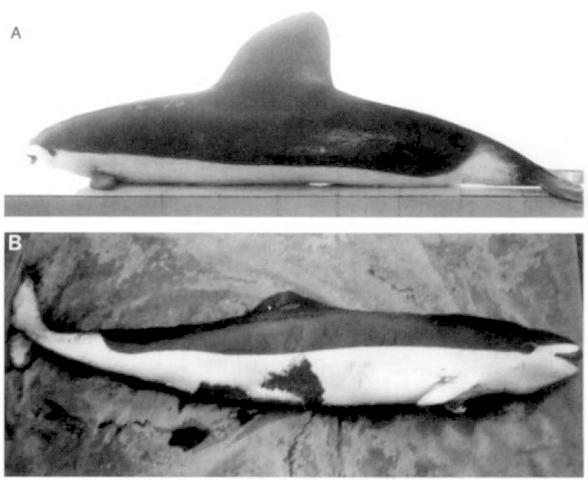 Little has been recorded regarding acoustical communication or perception, but the species probably uses echolocation in the same manner as other porpoises. 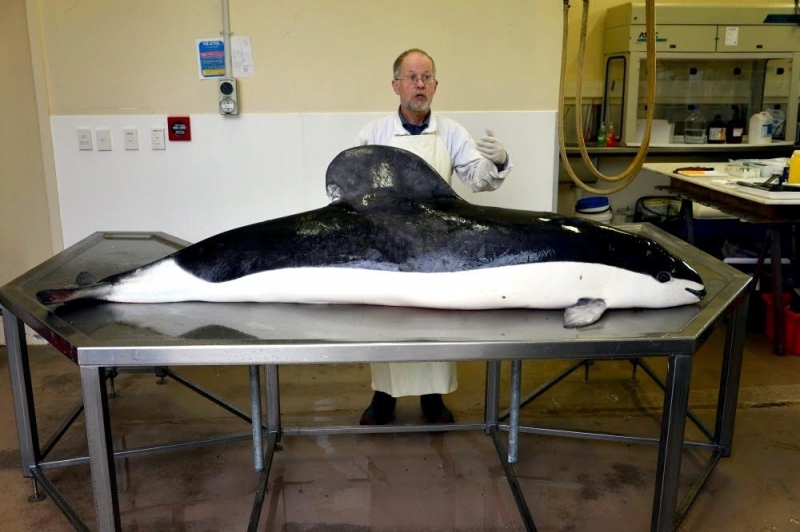 The IUCN Red List notes that the Spectacled Porpoise was previously known primarily from the southern coast of eastern South America, from Uruguay and southern Brazil to Tierra del Fuego, this species is now known from offshore in the southern Hemisphere. 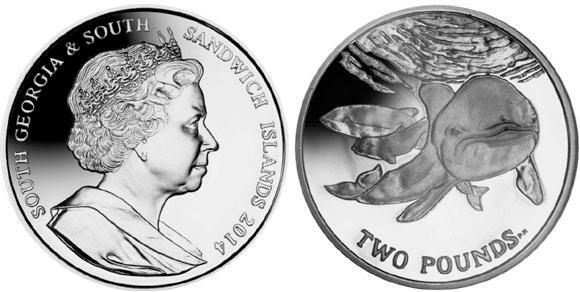 There are records from the Falkland Islands, South Georgia, Kerguelen Islands, Heard Island, Macquarie Island and the Auckland Islands. 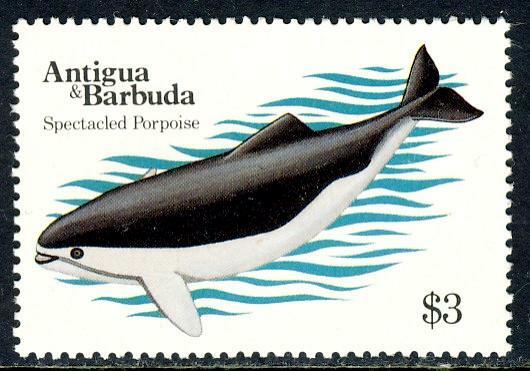 Although rarely seen at sea as there are only a few dozen live sightings ever recorded, this information suggests that the Spectacled Porpoise’s range may be circumpolar in the sub-Antarctic zone with water temperatures of at least 1-10°C. The southernmost sighting is from 64°34’S. 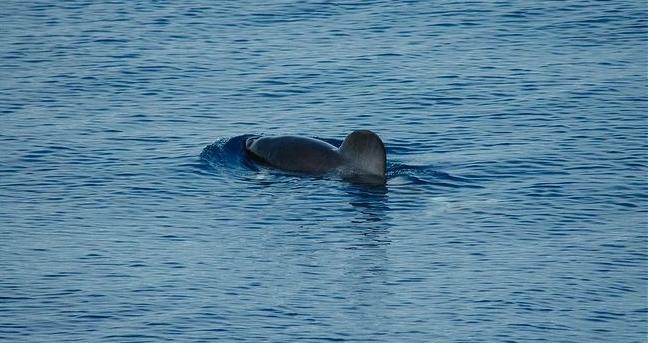 Spectacled Porpoises prefer cold ocean waters of the southern hemisphere. They normally live near offshore islands but are sometimes found in the open ocean. 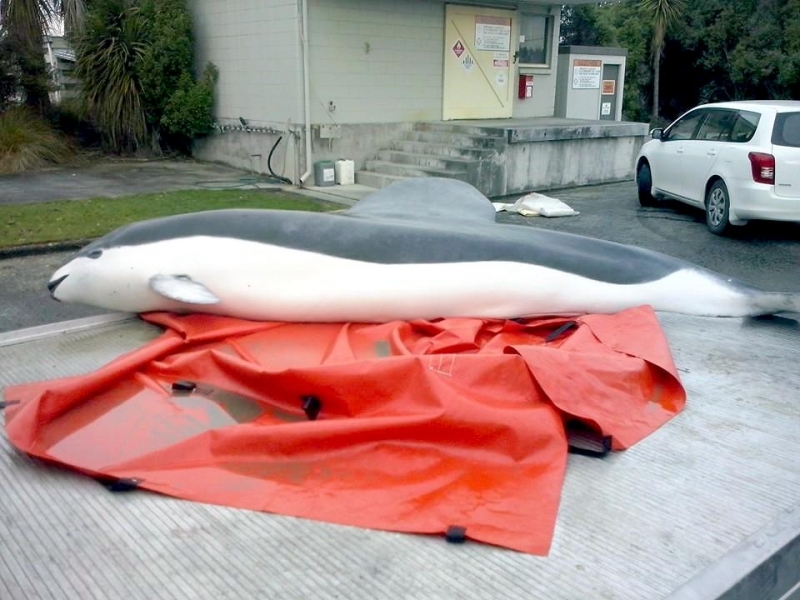 In any case they may be considered a temperate & sub-antarctic marine species. They seem to prefer the sub-antarctic area where there are cold currents like the Falkland Current. 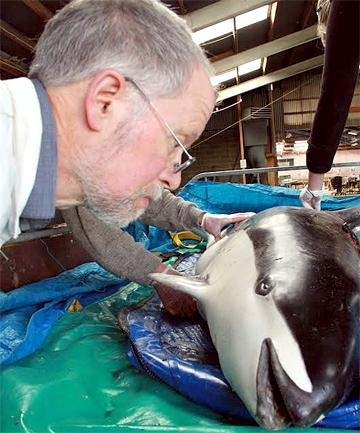 The food preferences of Spectacled Porpoises are not well-known. 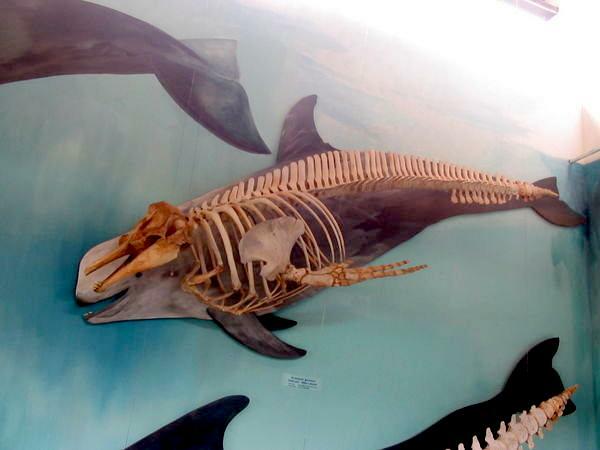 They are most likely similar to other porpoises, which eat bony fishes such as actinopterygii, cephalopoda, mollusks & crustacea. Nothing specific is known about their role in the ecosystem. Little has been recorded about their predation. 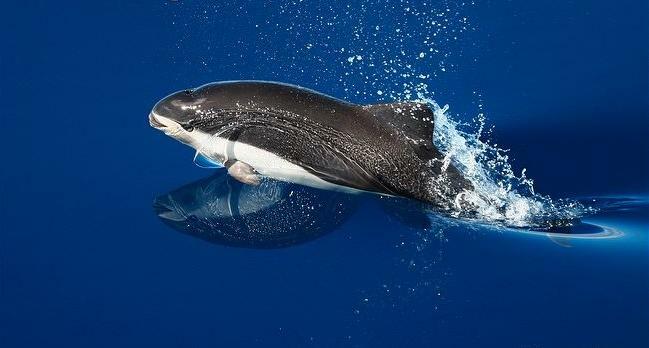 It is possible that Killer Whales are their only natural predators. 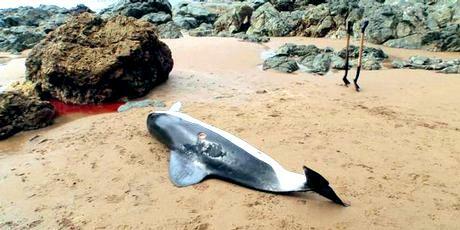 This porpoise species is are hunted by humans. 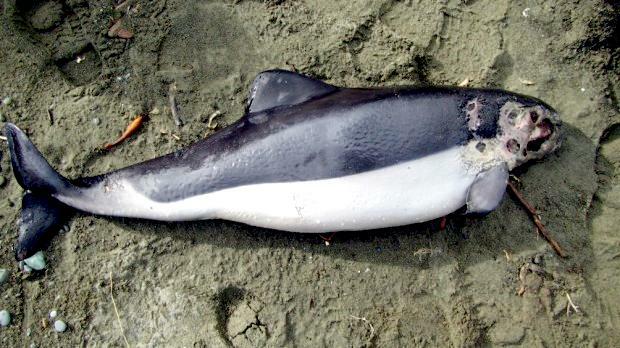 Spectacled Porpoises have no recorded adverse affects on humans. Native peoples in South America hunt them, but not for commercial uses. 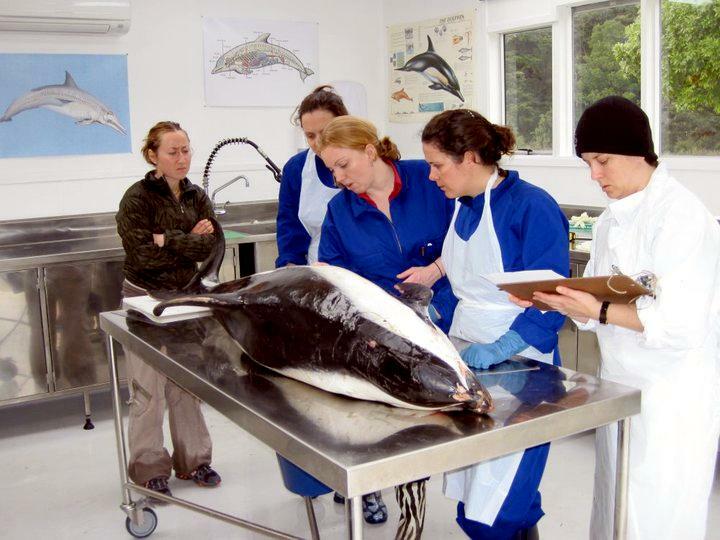 According to the IUCN Red List reports, Spectacled Porpoises are often be taken deliberately for crab bait off southern Chile. 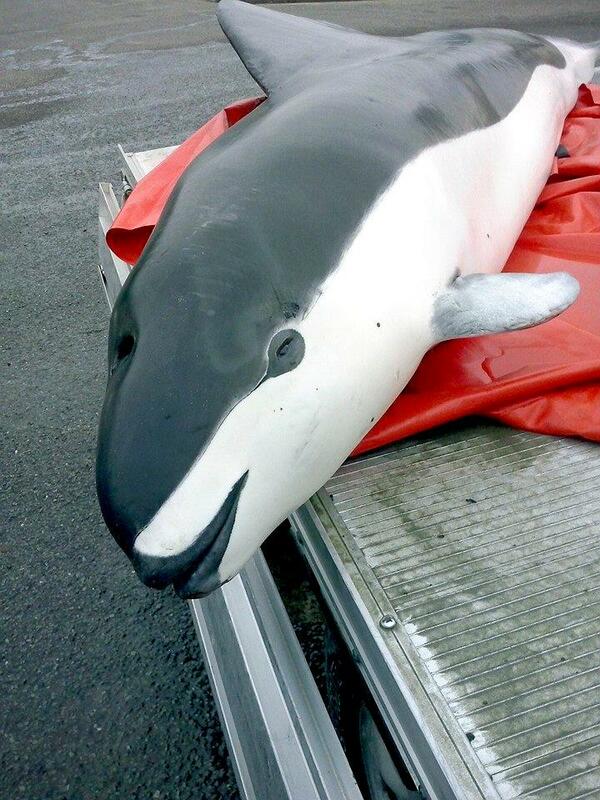 The effects of these catches on Spectacled Porpoise sub-populations are not known. 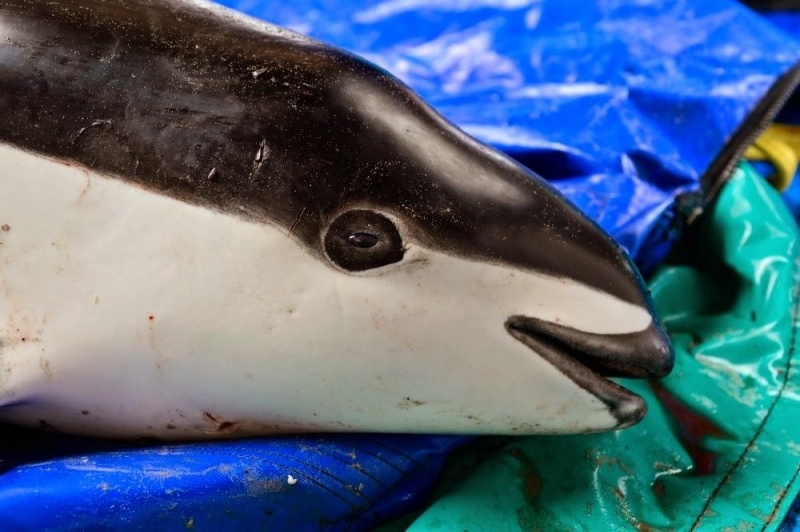 Like all phocoenoids, Spectacled Porpoises are frequently captured in gill-nets as by-catch. 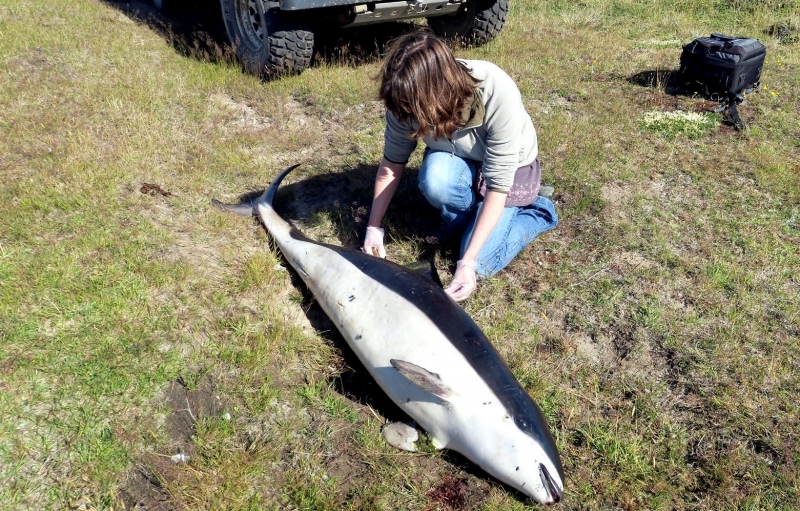 At least 34 animals were killed incidentally between 1975 & 1990 in coastal gill-nets set in Tierra del Fuego and there was a co-occurrence of strandings & fishing activity in southeastern Chile, suggesting additional undocumented mortality from this source. 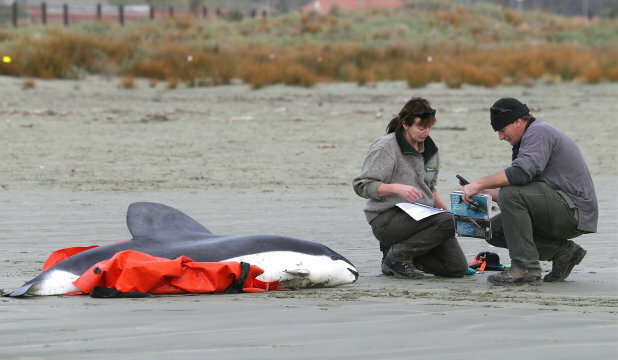 Some mortality of Spectacled Porpoises was also reported from bottom and mid-water trawls off the coast of Chubut, Argentina.